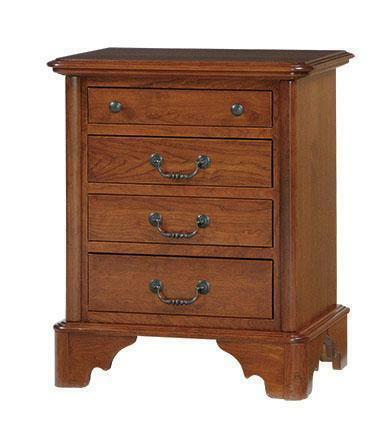 This Early American inspired night stand will bring a timeless style into your bedroom. Choose from solid Red Oak Wood or Cherry Wood in a wide variety of finishes. If you are looking to match this night stand to existing bedroom furniture we can do custom stain matching. Give one of our Amish furniture specialists a call with questions or ordering assistance. Early American furniture has a timeless elegance that will always be in style. Choose from solid Red Oak Wood or Cherry Wood in a wide variety of finishes.